Ignoring temporary walls which point to ongoing large-scale expansion, workers burn the midnight oil at Portugal’s byword for ceramic creativity to meet orders from around the globe. 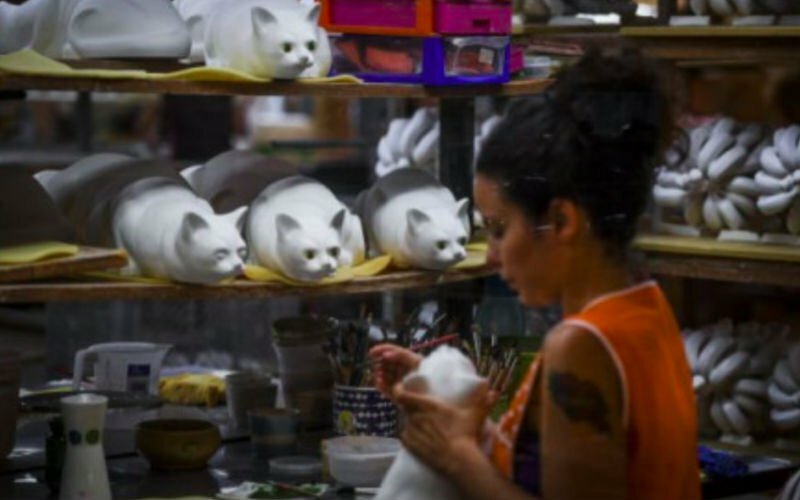 From traditional azulejos tiles, multi-coloured fruit-shaped tableware, animal-shaped vases and ceramic sardines, to Mick Jagger and Pope Francis figurines, the factory is a Portuguese porcelain fancier’s paradise. In the ensuing decade, sales have tripled and production has raced ahead 60 percent — hence the need to ramp up capacity at the site in the town, also renowned for its hot springs. Though some see elements of the firm’s intricate wares as kitsch, for collectors, it is a pillar of Portuguese contemporary artistic culture. Sculptors make each mould by hand and the most complex require multiple moulds. Bordallo Pinheiro’s status was underlined in May when London’s Monocle magazine for the high disposable income reader devoted several pages to it. It now plans to open its own stores, notably in Paris and beyond, rather than selling chiefly to other distributors — quite a turnaround from its previously bleak outlook due to tough competition from China. “Today, things are going much better. We’re proud of this expansion and I hope it will last,” says Formiga. Even as the company, now based on the town’s outskirts having converted its original more central site into a museum and shop, sets its sights still higher, it remains faithful to traditional, handmade manufacturing. “Bordallo will remain a kind of giant workshop. We want to pay tribute to our history by turning out almost exclusively handmade products,” says industrial director Tiago Mendes. “After a first phase of reorganisation, we are entering the growth phase,” administrator Nuno Barra tells AFP. “We place great value on brand and the quality of a product which continues to be made according to the notions of the artist originally behind it all — Raphael Bordallo Pinheiro,” Barra says. “He was captivated by the alchemy of ceramics as he found in it a means of expressing his creative genius” in a region rich in top quality clay, as well as traditional craftsmanship, says current artistic director Elsa Rebelo. It was Bordallo Pinheiro who created the famous “andorinhas” swallow sculptures, manifestations of which adorn many Portuguese houses as a symbol of family and home. Another notable creation was his Beethoven vase, a baroque-style offering, 2.6 metres (8.5 feet) tall, which stands outside Rio de Janeiro’s National Museum of Fine Arts. Bordallo Pinheiro invented the cartoon character “Ze Povinho”, (literally Joe Public), whose anti-establishment, man-of-the-people mockery made him a popular favourite in newspapers and magazines. When the firm was teetering, one of Portugal’s leading artists, Joana Vasconcelos, stepped in with several orders and used some of the œuvres bought in her own work.